The Stewart family owns and operates the historic 45,000-acre Alma Plantation in Pointe Coupee Parish. Now Walter Tharp, one of the family members, is launching a venture which will provide a new market for one of Louisiana’s most basic agricultural products. Tharp, his wife Yvette Bonanno-Tharp, and partner Jim Massey have begun Cane Land Distilling Co., which will distill and market rum at a distillery they are building on River Road in Baton Rouge. All their raw materials will be produced at Alma Plantation. Alma Plantation produces more than 100,000 metric tons of sugar, and Tharp believes the new distillery will be able to use some of that production to produce a high value product that will bring jobs and income to the Baton Rouge area. 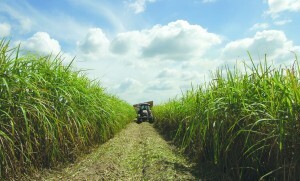 Cane Land plans to produce rum in three ways: 1) fermented immediately for rhum agricole, 2) cooked and concentrated into a syrup, and 3) processed into both molasses and crystalized sugar. His partner, Jim Massey, is a member of the American Distillers Institute. His wife Yvette is a celebrity chef and restauranteur. Their Master Distiller, Rory Donovan, was named Distiller of the Year. Tharp plans to start production in 2014. For more information, go to www.canelandrhum.com/canelanddistilleryco-investorbook.pdf.